Yesterday, I went digging for embarrassing songs that I love. In the course of my search, I ran across a lot of truly awful music. This is some of it. I’m pretty sure I bought this because of the name. The more blashemous and offensive a punk band’s name is, the more likely they are to be awful. However, being awful is part of punk. There’s good awful and then there’s just awful awful. This band is awful awful. The studio versions of the songs aren’t much better. Another band I probably bought because of the name. Another band that is awful awful. The music isn’t too terribly bad, but that guy’s voice is like a grater on my brain. Somehow, I have not one, but two albums by these guys. Boggles the mind. Eesh. Look at that hair! That Witchcraft is awesome (give it a minute). Well, I went looking for that and found this instead. I thought maybe it was another Witchcraft album I hadn’t heard. It actually was, but not from the right Witchcraft. Joy! Oopsies. Musicians, this is why you should always use a band name no one else has. At least, no one is ever going to confuse AntiChris & The Raped with another AntiChris & The Raped. 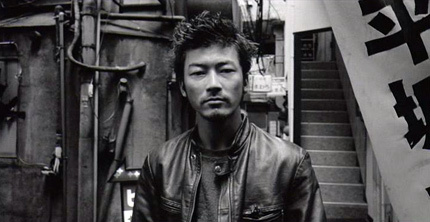 I have the soundtrack to Electric Dragon 80000V because Tadanobu Asano is hot. All songs on the soundtrack were done by 小野川浩幸, whatever that means. Both the movie and the soundtrack are terrible. It’s mostly Tadanobu beating up a perfectly innocent guitar and assailing our ears. I’m not sure why I own either. Because hot, I guess. Tadanobu Asano in Electric Dragon 80000V. I don’t even remember this song or that band from the 80s, do you? Nope, I don’t remember that one either. Where the hell did they come up with these names? Haysi Fantayzee? Really? It’s terrible, yet it lives in my digital library. WTF indeed. Man, the 80s were weird. 80s new wave bands are not the only ones to get embarrassed here. Oh, no. We have some embarrassing hip-hop, too. First, let’s embarrass Mr. LL Cool J.
Don’t you wish you could forget about the 80s, LL? Eesh. That’s gonna be stuck in my head for days. And, as if The Def Jam discs weren’t bad enough, I also have The Hip Hop Box set, which has an embarrassing amount of Hammer Pants. That’s awful. How did anyone listen to MC Hammer like ever? And quite possibly, the worst song ever recorded, Just A Friend. I think we’ll end on that off key note. Posted in music and tagged Awful horrible business, music. Bookmark the permalink. The Biz Markie song gets on my nerves because I like the Freddie Scott song “You’ve Got What I Need” but you can’t get into that song without people think you are going to start screaming “YOU SAY HE’S JUST A FRIEND” over and over. Parents Just Don’t Understand…I put this in the category of novelty songs like The Name Game and The Purple People Eater (that is what they meant for it be to like, right?). Ugh. I have always hated Just A Friend. Always. It’s an awful song. That would annoy me, too. Wow Goldie, I’m afraid to listen to most of it. I listen to a lot of stuff, but you got me beat as I was never into punk. But that’s probably because I’m a lot older than you. hahaha. We all have a few songs in our collection that we wouldn’t want anyone else to hear or know about. I was never much into punk though. I will listen to anything as long as I like it, regardless of genre. I have very eclectic taste. Lyrics have to speak to me for me to actually own the song though. I have very eclectic musical taste and will listen to anything regardless of genre, too. I do have a soft spot for punk though. I think everyone has a soft spot for one particular form of music than the rest, even if they’re not willing to admit it. OMG!!! That 80’s set sounds awesome! “Shiny Shiny” has always been one of my favorite lost 80’s hits… and I thought Biz Markie was one of those acts everyone agreed was so horrible that he was actually epic! I thankfully have no clue who a lot of those bands were in the first half of this post, but you hit a lot of my musical joy buttons in those last two albums! BTW, Oran Juice Jones’ “The Rain” is one of the few songs that had pop success that mentions a squirrel! I really don’t remember Shiny Shiny at all. That could be true of Just A Friend, but not with me. It’s always been like nails on chalkboard to me.